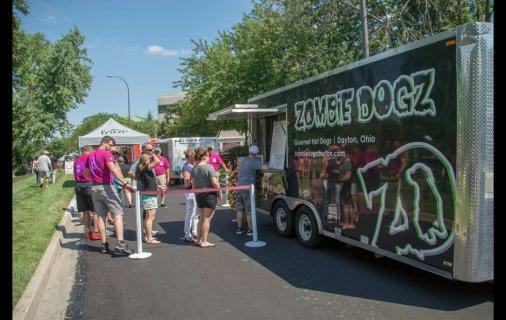 Dayton is serious about their love of food trucks. You know how some people REALLY love to watch the zombie shows on tv? Well, we&apos;re that obsessive about our Zombie Dogz. If you happen upon that black truck, just get in the line, even if you&apos;re not in the mood for hot dogs. It really has earned the cult following. All of the food trucks here are obsession-worthy in their own right. We cover all the important parts - the healthy to the "don&apos;t you dare talk to me about calories", the vegan to the meats, the grab n go snacks to the full on meals. If you&apos;re hungry, just peek outside, you might see your next meal coming down the street. Our friends over at Dayton.com put together an interactive guide to help you with your food truck knowledge and help you find them. You can find it here.